A SpaceX Falcon 9 rocket carrying a communications satellite launches on May 15, 2017 from Kennedy Space Center in Florida. A SpaceX capsule rocketed to the International Space Station on Monday, carrying tons of science research, plus ice cream. "Gorgeous day, spectacular launch," said Dan Hartman, NASA's deputy manager of the space station program. There was extra freezer space, so NASA packed little cups of vanilla, chocolate and birthday cake ice cream, as well as ice cream candy bars. Those treats should be especially welcomed by U.S. astronaut Peggy Whitson, in orbit since November. She's due back at the beginning of September. Newly arrived U.S. spaceman Randolph Bresnik turns 50 next month. The space station was zooming 250 miles above the Atlantic, just off Nova Scotia, when the Falcon took flight. It was the 14th successful booster landing for SpaceX and the sixth on the giant X at the company's touchdown spot at Cape Canaveral Air Force Station, just a few miles from its NASA-leased pad at Kennedy Space Center. "It's right on the bull's-eye, and a very soft touchdown," said SpaceX's Hans Koenigsmann. The mice on board are part of a study of visual problems suffered in space by some male astronauts. Scientists will study the pressure in the animals' eyes, as well as the movement of fluid in their brains. Thirty days for mice in space is comparable to three years for humans, according to Florida State University's Michael Delp, who's in charge of the experiment. The study may help explain why female astronauts don't have this vision problem, which can linger long after spaceflight, he added. The Dragon also holds an instrument to measure cosmic rays from the space station. This type of device has previously flown on high-altitude balloons. The Army has an imaging microsatellite on board for release this fall from the station. It's a technology demo; the military wants to see how small satellites like this, with low-cost, off-the-shelf cameras and telescopes, might support critical ground operations. It's about the size of a dormitory-room refrigerator. Also going up on behalf of the Michael J. Fox Foundation: protein crystals that, in space, might shed light on Parkinson's disease. The mission got a televised plug from Fox, an actor who has the disease. Three Americans, one more than usual, and an Italian will tackle all this scientific work in orbit. The station also is home to two Russians; that number will go back up to three in a year or so. This is the 13th delivery by the Hawthorne, California-based SpaceX, one of two private shippers hired by NASA. The other is Orbital ATK; its next supply run is in November from Wallops Island, Virginia. The SpaceX Dragon is the only supply ship capable of returning items to Earth. It parachutes into the Pacific; the others burn up during re-entry. This particular Dragon is brand new, as is the Falcon rocket. 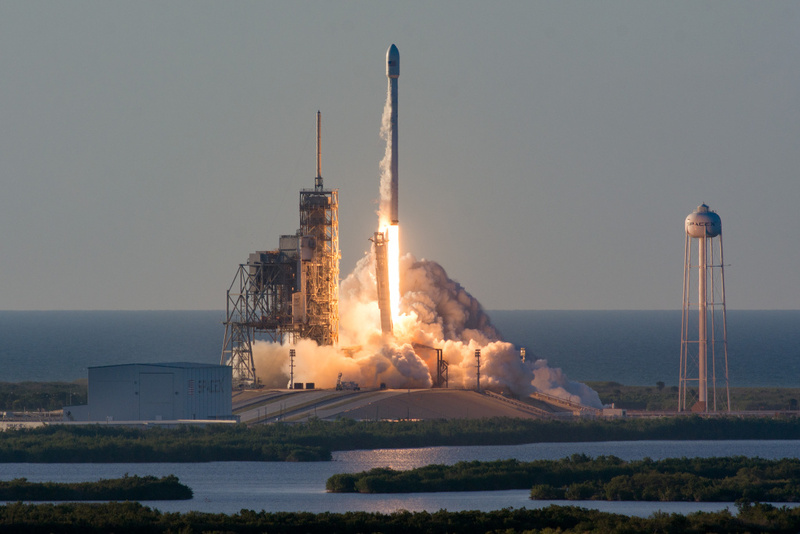 In June, SpaceX launched its first reused Dragon, and in March, its first reused Falcon. From now on, the company said it may only fly used Dragons. SpaceX is also developing a crew Dragon for NASA astronauts, set to debut next year. Boeing is working on its own capsule to ferry space station astronauts. In the meantime, SpaceX is aiming for a November debut of its Falcon Heavy rocket, which will feature three first-stage boosters and 27 engines, versus the single booster and nine engines on the Falcon 9. It will have two-thirds the thrust of NASA's Saturn V rocket, which was used during the Apollo moon program. All three of the Falcon Heavy's first-stage boosters are meant to fly back to a touchdown.